The Go board and pieces. A traditional Go board is wooden, with black painted lines. The stones are lenticular and fit closely together when placed on adjacent intersections. 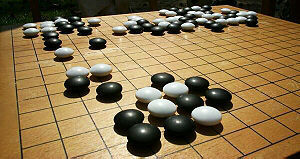 Go or Igo in Japanese (囲碁), Weiqi in Chinese (圍棋, 围棋), and Baduk in Korean (바둑), is a strategic board game. It was played in ancient China before 200 B.C.E.. The game is now popular throughout the world, especially in East Asia. 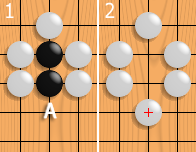 Go is played by alternately placing black and white stones on the vacant intersections of a 19×19 rectilinear grid. A stone is captured and removed if it is tightly surrounded by stones of the opposing color. The objective is to control a larger territory than the opponent by placing one's stones so they cannot be captured, but can capture any opposing stones played in one's territory. The game ends and the score is counted when both players consecutively pass on a turn, indicating that neither side can increase its territory or reduce its opponent's; the game can also end by resignation. The size of the board and the number of pieces give rise to 2.1×10170 possible positions, and it is said that the same game has never been played twice. Players must be aware of action in several areas of the board simultaneously, and the play evolves through numerous stages as players make their moves. Originally played in China, Korea and Japan, the game began to gain popularity in the West during the twentieth century. It is especially popular with students because it develops their mathematical and strategic thinking. Through experience the Go player gains a deeper understanding of the game, which requires not only strategy but forward thinking and learning to take control of the game board by moving aggressively while protecting the position already achieved. High-level players learn to interpret the shapes formed by the game pieces on the board and to develop their strategy according to their intuitive sense of the direction in which the game is flowing. Many Go players enjoy the complexity of the game because they feel it resembles the complexity of life. In many East Asian cultures, Go was considered one of the most important skills a civilized person could learn. This screen was made by Kano Eitoku in the 16th century. The game is called Go in many languages; this word originated from the Japanese pronunciation "go" of the Chinese characters 棋/碁; in Japanese the name is written 碁. The Chinese name Weiqi (圍棋,围棋) roughly translates as "encirclement chess," "board game of surrounding," or "enclosing game." Its ancient Chinese name is 弈 (yì). The writings 棋/碁 are variants, as seen in the Chinese Kangxi dictionary. The game is most commonly known as 囲碁 (igo) in Japanese. Because Japanese professionals taught the first Western players, the latter naturally used the Japanese name in early German-language and then English-language books and articles about the game. The Japan Go Association has long played a leading role in spreading Go outside East Asia, publishing the English-language magazine Go Review in the 1960s, establishing Go Centers in the US and Europe, and often sending professional teachers to Western nations for extended periods. As a result, many Go concepts for which there is no ready English equivalent have become known elsewhere by their Japanese names. In order to differentiate the game from the common English verb "go," the game is sometimes spelled with a capital G; this convention, however, is not followed in most of the technical literature on the game. An alternative but uncommon spelling is Goe, proposed by Ing Chang-Ki, the late wealthy promoter of Go (particularly in Taiwan and the U.S.), for the same reason. This spelling is not widely used outside of events sponsored by the Ing Foundation. Some legends trace the origin of the game to Chinese Emperor Yao (堯) (2337–2258 B.C.E.) who is said to have designed it for his son, Danzhu, to teach him discipline, concentration, and balance. Other theories suggest that the game was derived from Chinese warlords and generals who used pieces of stone to map out attacking positions, or that Go equipment emerged from divination paraphernalia. The earliest written references to the game come from the Zuo Zhuan, which described a man in 548 B.C.E. who liked the game, and Book XVII of the Analects of Confucius, compiled sometime after 479 B.C.E. Chinese archaeologists have discovered a porcelain go board from the Western Han Dynasty (206 B.C.E.–24 C.E.) in northwest China's Shaanxi Province. This is the earliest discovery of a board unearthed in China, and suggests that people started playing go more than 2,000 years ago. The board was found in the ruins of a watchtower at the tombs of Emperor Jingdi of the Western Han Dynasty, and his empress. The board, slightly damaged and irregular, measures 5.7 cm to 28.5 cm long, 17 cm to 19.7 cm wide and 3.6 cm thick. It is carved with 17 ordinate and 17 transversal lines, which is similar to the modern (19×19) board. Li Gang, a research fellow with the Shaanxi Provincial Archaeological Research Institute, said that this board might have been made from a floor tile, and that it did not belong to the royal family since the carvings are too rough. 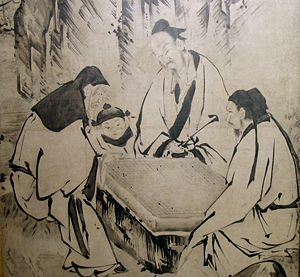 The board may have been made by tomb guards, who played Go to pass the time, which would indicate that go was being played not only by nobles, but also by ordinary people more than 2,000 years ago. A stone board made in the Eastern Han Dynasty (25–220 C.E.) was found in Wangdu County, north China's Hebei Province, in 1954. 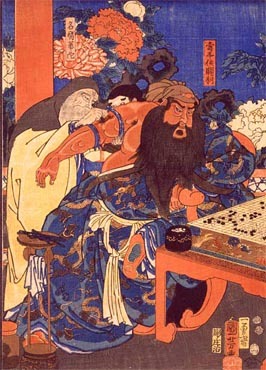 In China, Go was perceived as a popular game of the aristocratic class while Xiangqi (Chinese chess) was the game of the masses. Go was considered one of the cultivated arts of the Chinese scholar gentleman, along with calligraphy, painting and playing the guqin, together known as 琴棋書畫 (琴棋书画|四艺, Sìyì), or the Four Arts of the Chinese Scholar. By the seventh century Go had reached Japan from China, and during the eighth century it gained popularity at the imperial court. By the beginning of the thirteenth century, Go was played by the general population of Japan. In 1603, Tokugawa Ieyasu created Japan's first unified national government. Almost immediately, he appointed the best Go player in Japan, Honinbo Sansa, as head of a newly founded Go academy (the Honinbo school, the first of several competing schools founded around the same time). These officially subsidized Go schools greatly developed the level of play, and introduced a system of ranking players similar to that used in martial arts. Players from the four houses (Honinbo, Yasui, Inoue, Hayashi) competed in the annual castle games for status and the position of Godokoro, or Minister of Go. Players like Honinbo Shusaku became national celebrities. The government discontinued its support for the Go academies when the Tokugawa shogunate was dismantled in 1868 as part of the Meiji Restoration. Historically, Go has seen unequal gender participation. However, the opening of tournaments to women and the rise of strong female players, most notably Rui Naiwei, has in recent years encouraged the strength and competitiveness of emerging female players. Around 2000, in Japan, the manga (Japanese comic) and anime series Hikaru no Go popularized Go among the youth and started a Go boom in Japan. Scott A. Boorman's The Protracted Game: A Wei-Chi Interpretation of Maoist Revolutionary Strategy , likens historical events to the game of Go, saying that the Maoists were more skillful at surrounding territory. Mao Zedong himself was a Go player. 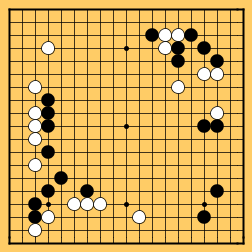 Go is a perfect information, deterministic, strategy game, in the same class as chess, checkers (draughts), and reversi (othello). The playing of the game is not similar to these, except for some common features it shares with reversi. Although the rules of Go are very simple, the practical strategy is extremely complex. The game emphasizes the importance of balance on multiple levels, and has internal tensions. To secure an area of the board, it is good to play moves close together; but to cover the largest area one needs to spread out, perhaps leaving weaknesses that can be exploited. Playing too low (close to the edge) does not secure sufficient territory and influence; yet playing too high (far from the edge) allows the opponent to invade. Many people find Go attractive because it reflects the conflicting demands of real life. 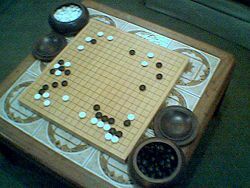 It has been claimed that Go is the most complex game in the world, according to several measures, including the spread of identifiable levels of skill. Its large board and lack of restrictions allow great scope in strategy and expression of players' individuality. Decisions in one part of the board may be influenced by an apparently unrelated situation in a distant part of the board. Plays made early in the game can shape the nature of conflict a hundred moves later. The game complexity of Go is such that even an introduction to strategy can fill a book, and many good introductory books are available. possible games, all of which last for over 4.1×1048 moves. In comparison, the number of legal positions in chess is estimated to be between 1043 and 1050. After move 40 of round 1 of the 1989 Meijin tournament, little territory has been claimed. Although Go can be played with a piece of cardboard for a board and a bag of plastic tokens, the finest equipment costs thousands of dollars. Many players derive great aesthetic and sensual satisfaction from playing with quality equipment. The traditional Go board (goban in Japanese) is solid wood, from 10 to 18 cm. thick, and often stands on its own attached legs. It is preferably made from the rare golden-tinged Kaya tree (Torreya nucifera), with the very best made from Kaya trees up to 700 years old. More recently, the California Torreya (Torreya californica) has been prized for its light color and pale rings. Other woods often used to make quality table boards include Hiba (Thujopsis dolabrata), Katsura (Cercidiphyllum japonicum), and Kauri (Agathis). So-called Shin Kaya is a potentially confusing merchant's term: shin means "new" and "shin kaya" is best translated "faux kaya"—the woods so described are biologically unrelated to Kaya. Players sit on rice-straw mats (tatami) on the floor to play. The pleasantly smooth stones (go-ishi) are kept in matching solid wood bowls (go-ke) and are made of clamshell (white) and slate (black). The classic slate is nachiguro stone mined in Wakayama prefecture and the clamshell comes from the Hamaguri clam. The natural resources of Japan have been unable to keep up with the enormous demand for the native clams and slow-growing Kaya trees; both must be of sufficient age to grow to the desired size, and they are now extremely rare at the age and quality required, raising the price of such equipment tremendously. In clubs and at tournaments, where large numbers of sets must be maintained (and usually purchased) by one organization, expensive traditional sets are not usually used. For these situations, table boards (of the same design as floor boards, but only about 2–5 cm thick and without legs) are used, and the stones are made of glass rather than slate and shell. Bowls are often plastic if wooden bowls are not available. Plastic stones could be used, but are considered inferior to glass as they are generally too light, and stick to the fingers even after being released. Most players find that the lower price does not justify this distraction. Traditionally, the board's grid is 1.5 shaku (an archaic measure equal to 30.3 cm.) long by 1.4 shaku wide (455 mm. by 424 mm.) with space beyond to allow stones to be played on the edges and corners of the grid. This often surprises newcomers: it is not a perfect square, but is longer than it is wide, in the proportion 15:14. Two reasons are frequently given for this. One is that when the players sit at the board, the angle at which they view the board gives a foreshortening of the grid; the board is slightly longer between the players to compensate for this. Another suggested reason is that the Japanese aesthetic finds structures with geometric symmetry to be in bad taste. Traditional stones are made so that black stones are slightly larger in diameter than white; this is probably to compensate for the optical illusion created by contrasting colors that would make equal-sized white stones appear larger on the board than black stones. The difference is slight, and since its effect is to make the stones appear the same size on the board, it can be surprising to discover they are not. The bowls for the stones are of a simple shape, like a flattened sphere with a level underside. The lid is loose-fitting and is upturned before play to receive stones captured during the game. The bowls are usually made of turned wood, although small lidded baskets of woven bamboo or reeds make an attractive cheaper alternative. The traditional way to place a Go stone is to first take a stone from the bowl, gripping it between the index and middle fingers, and then place it directly on the desired intersection. It is permissible to strike the board firmly to produce a sharp click. Many consider the acoustic properties of the board to be quite important. The traditional goban will usually have its underside carved with a pyramid called a heso recessed into the board. Tradition holds that this is to give a better resonance to the stone's click, but the more conventional explanation is to allow the board to expand and contract without splitting the wood. A board is seen as more attractive when it is marked with slight dents from decades (or centuries) of stones striking the surface. The widespread use of Japanese terminology in the West notwithstanding, Chinese and Korean members of the international Go community, including professionals, continue to advocate for the primacy of terms from their language in common usage. They point out that in recent years, many Chinese and Korean players have also taught Western students. There is also no exact equivalence of concepts in different Asian languages, meaning that Go is still without a standard technical jargon. A very small number of Korean-language terms have come into use (e.g. haengma). The closest English meaning is 'latent potential.' From the Japanese, aji is the word for taste, and in Go refers to the lingering potential of dead stones to provide possible avenues of subtle play. Though aji might never be used, it has a bearing on the course of the game. Good aji is when your groups are strong, and have little or no possibility of being compromised. Bad aji is where dead stones or weaknesses in one's own formation carry a latent threat of compromising an existing area, should the situation become ripe. Aji is different from a simple defect or weakness in that it can be exploited and/or repaired in more than one way, or at more than one stage of the game, and which way or time is best will not be clear until later; hence the "aftertaste" metaphor. "Atari" (Chinese: "dachi (打吃)"; Korean "dansoo (단수)" is a term used for a positional state where a stone or group of a number of stones has only one liberty, and may be captured on the next move if it is not given attention. It can be a verb to describe the act of placing a group under atari, as well as an adjective to describe the status of a group, as being "in (the state of) atari." It may be spoken aloud during the game by the instigator, as a courtesy to call the opponent's attention to the fact that his stone or group is endangered; but that is now considered obsolete etiquette of the game and is not currently used. Atari is somewhat comparable to the concept of "check" in the game of chess. Tengen (天元): the (10, 10) point at the centre of the 19×19 goban. Komoku (小目): a (4, 3) or (3, 4) point in a corner; meaning "little point" in Japanese. Mokuhazushi (目外し): a (3, 5) or (5, 3) point in a corner; roughly "separated point" in Japanese. Sansan (三々): a (3, 3) point in a corner; literally "3, 3" in Japanese. Gote means being on the defensive; the opposite is sente (see below) . Black plays in sente when White realizes that Black could follow up in a damaging way; White must repair the defect in his position or suffer a loss, and Black continues to "have sente." Often there are several ways to respond to a sente move. In this example, White wants to find a response that nullifies Black's threat, while also threatening Black. If White succeeds, Black will be forced to answer, and White will have "taken sente" from Black. In the context, of the board game Go, kiai often translates as "fighting spirit," aggressiveness or initiative. Kiai means keeping sente, not letting the opponent have his or her way. A passive player may follow an opponent around the board responding to each move in turn. Kiai moves are the opposite of passive or submissive and a player showing kiai will dictate the direction of play. Kiai moves can catch an opponent off-balance and turn the game around. Examples of kiai moves include snatching sente away from the opponent; breaking through and counter-attacking; or answering a kikashi (forcing move) with an unexpected move. Kiai is also a term used in Japanese martial arts. Kikashi is a forcing move in the context of an attack. Unlike sente, though, a move is kikashi when it yields a high efficiency in play by causing the opponent to regard that move in making a change in its course of action. A kikashi stone can generally be sacrificed but meanwhile it still might have an advantage, e.g. a ladder breaker, while the answering move has no value at all. Moves can be kikashi, or not, depending on whether or not they are answered with appropriate sophistication. If the answering move strengthens the position, then the play is not kikashi but aji keshi (ruining one's own potential). Korigatachi is translated as 'over-concentrated'. If a player uses his stones in an inefficient way, the result will be korigatachi. So, knowing something about korigatachi should tell you how to avoid it. A vacant point that is immediately adjacent to a stone either directly up, down, left or right from it, or connected through a continuous string of same-colored stones to such a point. A single stone must always have at least one liberty to survive and a group should usually have at least two separate guaranteed internal liberties (eyes) to be considered alive. If a group is surrounded, having at least two eyes ensures that it cannot be captured by the opponent if correctly defended. Some living groups cannot be captured at all, and need no defense even if attacked. Miai in Go are, in the simplest terms, a pair of points on the board that are equivalent in terms of value. For example, if we call them A and B, and if Black plays at A, White can play at B and will suffer no disadvantage from the exchange. This occurs often during a game. With respect to a group's development or survival, pairs of points are frequently seen, such that if one player occupies one of them, his opponent will occupy the other. Miai can be seen in the fuseki stage on a large scale, or in a simple life and death problem, such as a straight four-space eye. Such shape is alive, because of two central points a and b, if White plays b, Black can answer with a and vice versa. Development of a flexible, efficient position that is difficult for the opponent to attack, often by means of contact plays and sacrifice tactics. Seki is a Japanese term used to describe an impasse that cannot be resolved into simple life-and-death. For example, a capturing race may end in a position in which neither player can capture the other. There are numerous types of seki position that can arise, characterized as cases in which neither player adds a play to groups that do not have two eyes. The area remains untouched; at the end all groups involved are deemed alive, but no territory is scored. (This is under the Japanese rules.) This type of situation has been called dual life, by Janice Kim. Sente (Korean "sunsoo (선수)") means having the initiative; the opposite of this is gote (see above). A sente move, for instance by Black, implies a severe follow-up. The opponent (White) will generally find it prudent to avert this threat by answering nearby. This leaves the original player (Black in this example) free to play where he chooses, thereby controlling the flow of the game. In most games, the player who is able to keep sente most of the time will win. However, one should never simply play sente for its own sake. A player who forces his opponent to make a valuable move that settles the position is said to have made a "thank-you" move. A special type of "reverse sente" comes up at the end of the game. Sente endgame moves allow the player with sente to go around the board whittling away at the opponent's territory. In this situation, a player who has used up his sente moves may look for a play that, while gote (see above), prevents the opponent from making a sente endgame move. This is called "reverse sente." Shape is the property of a group of stones expressing their flexibility and efficiency at staying connected, forming eyes, and maintaining liberties. Stones are said to have good shape if they are efficient and flexible, or bad shape if they are inefficient. Classic examples of good shape are the ponnuki (four stones in a diamond, enclosing a single empty point) and the bamboo joint (a 2x3 pattern of two stones, two spaces and two more stones). Examples of bad shape are the empty triangle (three stones forming an 'L') and the dango (large clump of stones not containing any eyes). Joseki is in large part the study of forming good shape with your stones. "Thickness" is a literal translation of a Japanese word that connotes the position of power and impregnability conferred by the thickness of medieval castles' stone walls. It is the power or influence exerted when a player's position is developed beyond the level of the area around it. A large wall is a common example of thickness in that it has no weaknesses and will provide help to friendly stones in the area. Considering the proverb, "do not try to make territory from thickness," stronger players will avoid making strong areas any stronger (as this will waste moves). Instead they will play in underdeveloped areas and allow their thickness to have a subtle influence over play on the rest of the board. 様子(yosu) means situation or the state of things, and 見る(miru) is "to see," thus "yosu o miru," to "see how things stand." In Japanese this expression is usually used to say that it's better to wait and see before taking an action (e.g. "shibaraku yosu o miru beki da," it's better to wait and see for a little while). It is not a single word or a set phrase except in Western Go literature, and "probe" is the preferred word, being self-explanatory and actually used by the speakers of its originating language. This picture shows one black unit and two white units. Their respective liberties are shown with dots. Note that liberties are shared among all the stones of a unit. If White plays where his two units share a liberty, they will be connected into one. If white plays at A, the black unit loses its last liberty, and is captured and removed from the board. Two players, Black and White, take turns placing a stone (game piece) on a vacant point (intersection) of a 19 by 19 board (grid). Black moves first. Other board sizes such as 13x13 and 9x9 may be used for teaching or quick games, but 19x19 is the standard size. Once played, a stone may not be moved to a different point. A vacant point adjacent to a stone is a liberty for that stone. Adjacent stones of the same color form a unit that shares its liberties in common, cannot subsequently be subdivided, and in effect becomes a single larger stone. Units may be expanded by playing additional stones of the same color on their liberties, or amalgamated by playing a stone on a mutual liberty of two or more units of the same color. A unit must have at least one liberty to remain on the board. When a unit is surrounded by opposing stones so that it has no liberties, it is captured and removed from the board. If a stone is played where it has no liberties, but it occupies the last liberty of one or more opposing units, then such units are captured first, leaving the newly played stone at least one liberty. Ko rule": A stone cannot be played on a particular point if doing so would recreate the board position that existed after the same player's previous turn. A player may pass instead of placing a stone, indicating that he sees no way to increase his territory or reduce his opponent's territory. When both players pass consecutively, the game ends and is then scored. Go allows one to play not only even games (games between players of roughly equal strength) but also handicap games (games between players of unequal strength. Without a handicap, even a slight difference in strength will generally be decisive. Game 5 of the 2002 LG Cup final between Choe Myeong-hun (white) and Lee Sedol (black) at the end of the opening stage; white has developed a great deal of potential territory, while black has emphasized central influence. compensation points, almost always for the second player (komidashi). compensation stones placed on the board before alternate play, allowing players of different strengths to play competitively. "superko": the rule that a move must not recreate the previous position is extended to disallow any previous position. This prevents complex repetitive situations ("triple ko," "eternal life," etc.) from cycling indefinitely. Connection: Keeping one's own stones connected means that fewer groups need defense. Cut: Keeping opposing stones disconnected means that the opponent needs to defend more groups. Life: This is the ability of stones to permanently avoid capture. The simplest way is for the group to surround two "eyes" (separate empty areas), so that filling one eye will not kill the group and therefore be suicidal. Death: The absence of life, resulting in the eventual removal of a group. Invasion: Setting up a new living position inside an area where the opponent has greater influence, as a means of balancing territory. Reduction: Placing a stone far enough into the opponent's area of influence to reduce the amount of territory he/she will eventually get, but not so far in that it is cut off from friendly stones outside. The strategy involved can become very abstract and complex. High-level players spend years perfecting understanding of strategy. One of the fundamental strategies of Go involves keeping stones connected in groups. Connecting individual stones into a single group results in an increase of liberties. For instance, a single stone played in the center of the board has four liberties, while two adjacent stones in the center of the board form a unit with six. To capture the unit, an opponent would have to play stones on all of its liberties. Thus connected stones are stronger because they share their liberties. Since connecting stones keeps them secure, an important offensive tactic is to prevent the opponent from connecting his stones, while at the same time keeping one's own stones connected. This act of dividing the opponent's stones into separate groups is called cutting. While one should generally try to keep one's own stones connected, situations exist where doing so would be a wasted move. Stones are considered tactically connected if no move by the opposing player could prevent them from being connected. A common example is the configuration of stones in the shape of a "plus" sign. Although none of the stones actually connects to any other stone, they are tactically connected because an opponent playing in any of the available liberties would have no effect on the progress of play. In a handicap game, Black starts with one or more handicap stones played before White's first move. If played in the traditional places on the fourth line from the edge of the board, these stones will mainly be useful for the purpose of connection and separation of stones played closer to the edge ("lower"). 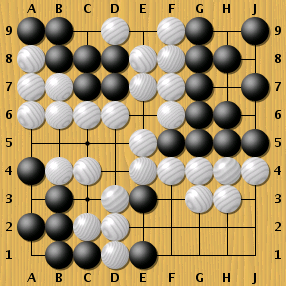 The White player's stones are threatened immediately with separation, while Black has many potential connections to begin with. An example of inefficiency or poor coordination of stones in the context of connection is the empty triangle, where a stone has been played to connect before it is necessary. A key concept in the tactics of Go, though not part of the rules, is the classification of groups of stones into alive, dead or unsettled. At the end of the game, groups that cannot avoid being captured during normal play are removed as captures. These stones are dead. Groups can reach this state much earlier during play; a group of stones can quickly run out of options so that further play to save them is fruitless, or even detrimental. Similarly, further play to kill such a group is often of no benefit (except when securing liberties for an adjacent group), since if it remains on the board at the end of the game it is captured anyway. Thus groups can be considered "dead as they stand," or just dead, by both sides during the course of the game. Groups enclosing an area completely can be harder to kill. Normally, when a play causes an area completely enclosed by the opponent to become filled, the group filling the area is captured since it has no remaining liberties (such a play is called "suicide"). Only if the last play inside the area would kill the enclosing group, thus freeing one or more liberties for the group that filled the space, can the play be considered. This can only be achieved if the liberties on the outside of the enclosing group have been covered first. Thus, enclosing an area of one or more liberties (called an eye) can make the group harder to kill, since the opponent must cover all of its external liberties before covering the final, internal liberty. From this, it is possible to create groups that cannot be killed at all. If a group encloses two or more separate areas (two or more eyes), the opponent cannot simultaneously fill both of them with a single play, and thus can never play on the last liberty of the group. Such a group, or a group that cannot be prevented from forming such an enclosure, is called alive. Groups which are not definitely alive nor definitely dead are sometimes called unsettled groups. Much of the tactical fighting in Go focuses on making one's own groups live, by ensuring they can make two eyes, and on making the opponent's groups die, by denying them two eyes. Determining ahead of time whether a group is currently alive, dead, or unsettled, requires the ability to extrapolate from the current position and imagine possible plays by both sides, the best responses to those plays, the best responses to those responses, and so on. This is called reading ahead, or just reading, and it is a skill that grows with experience. Many players study books of life and death problems to increase their skill at reading more and more complicated positions. In general, go players refer to analysis of positions as reading. One major purpose of reading is to be sure that a local position can be neglected for a while. For instance, a player may be able to make gains by playing for a certain patch of territory. Yet, this play may be worth only a few points, and thus deemed unnecessary, depending on the state of the game. With confidence in one's reading, it becomes much easier to set priorities and switch around the board. Inability to change gears at the correct time can lead to a drastic loss of opportunity. In other cases, however, switching gears at an incorrect time can lead the opponent to thinking you have read something which he has not. This may be considered a bluff. In order to build a harmonious position, usually in the opening, one does not place all stones on the third line, nor all stones on the fourth line. "Harmonious" is here not just an aesthetic quality; it stands for a better level of overall (strategic) connection of the stones. An outwardly-facing position that cannot be attacked, that is, one which can easily get two eyes so does not need to answer enemy moves close by, is called thick. Thick positions are important as they radiate influence across the board. An error that is often made by weaker players is to make territory in front of their thick position; this is inefficient because the player is likely to get that territory anyway. Thickness is better used from a distance, as support for other actions. For example, if Black has a thick group and a weak group nearby, and White attacks the weak group, Black can have its weak group run towards its thick group. If successful, the strength of the thick group will protect the weak group. Or, if White tries to invade near a thick group, Black can try to push White towards its thick group. If Black is successful, the strength of the thick group will help destroy the invasion. A thick group can also support invasion of enemy spheres of influence. A light group is also one that is hard to attack, but for a different reason. If a group has a large number of options, often including the sacrifice of part of it, it is called light. Because it is usually impossible to take away all or almost all options, attacking such a group is very hard for the opponent and brings little advantage. A weak group which cannot be sacrificed at will is called heavy. A large part of the middle game of a game of Go is usually spent by one player attacking the other player's weak group(s). What is important to remember is that in most cases the goal of an attack is not to kill the attacked group, but to gain territory or influence. The attack is more or less used to restrict the opponent's options and make it impossible for him to make territory or influence himself. The Ko rule states that a stone cannot be played on a particular point if doing so would recreate the board position that existed after the same player's previous turn. Suppose that Black begins a ko by taking a stone of White's. White cannot immediately recapture; the rules state that he must, for the moment, play elsewhere. White may believe that good strategy requires he eventually recapture, but Black, on her next turn, will have the option of ending the ko, for example by filling in the spot White would use to recapture. To prevent Black from doing this, White can play a ko threat. A ko threat is a move that forces one's opponent to respond, or risk a punishing blow. A ko threat by White will force Black to choose between responding to the threat, and allowing White to recapture (thereby continuing the ko), or ending the ko, but having a damaged, poor position elsewhere on the board. Good ko threats, generally speaking, are ones which threaten to do so much damage to one's opponent that they must be responded to. 'Sente', 'gote', and 'tenuki are Japanese terms in Go theory. Sente loosely corresponds to taking initiative through a sequence, and gote loosely corresponds to the responsibility of defense. A Tenuki play breaks sequence, moving elsewhere. Tenuki indicates either a natural pause in sequence or a disagreement as to the importance of an area of the board. Because the Go board is so spacious, this sense of balance between attack and defense, amongst different areas, holds great importance. 'Taking gote unnecessarily' means that one defended for oneself a smaller area of the board than one could have threatened to take from the opponent, elsewhere, 'in sente. The whole board opening is called Fuseki. The first moves are usually played on or near the 4-4 star points in the corners, because in those places it is easiest to make territory. (In order to be totally secure alone, a corner stone must be placed on the 3-3 point. However, if a stone is placed at a 4-4 point and the opponent invades, the first player can build a surrounding wall as the second (invader) is forming a live group, thus exerting strong influence on a large area.) After that, standard sequences (Joseki) are used to divide corners, and extensions along the side are made. Usually, the center area is kept empty the longest. Plays are usually on the third or fourth line; the second makes too little territory, while the fifth is too easily undermined by a play on the third. A play on the fourth line is directed more toward influencing the center, a play on the third line more toward making territory along the side. In higher levels of play, some players will say that the stones "talk" to them. It is in the nature of the stones to easily expand in certain directions. This is to say that the stones themselves state the Direction of Play that the game should continue in. The ability to recognize the correct direction of play can come from extensive play or from studying. Around the rank of AGA 5kyu, it becomes an important factor in all games. To ignore Direction of Play generally creates awkward and slow play. Understanding this concept can easily improve your game by 2 ranks. The direction of play is dictated by both the shape of the stones from both sides and the absolute position of the shape on the board. It only occasionally repeats outside of joseki. Go is not easy to play well. With each new level (rank) comes a deeper appreciation for the subtlety and nuances involved, and for the insight of stronger players. The acquisition of major concepts of the game comes slowly. Novices often start by randomly placing stones on the board, as if it were a game of chance; they inevitably lose to experienced players who know how to create effective formations. An understanding of how stones connect for greater power develops, and then a few basic common opening sequences may be understood. Learning the ways of life and death helps in a fundamental way to develop one's strategic understanding, of weak groups. It is necessary to play some thousands of games before one can get close to one's ultimate potential Go skill. Familiarity with the board shows first the tactical importance of the edges, and then the efficiency of developing in the corners first, then sides, then center. The more advanced beginner understands that territory and influence are somewhat interchangeable, but there needs to be a balance. It is best to develop more or less at the same pace as the opponent in both territory and influence. This intricate struggle of power and control makes the game highly dynamic. Often, a comparison of Go and chess is used as a parallel to explain Western versus Eastern strategic thinking. Go begins with an empty board. It is focused on building from the ground up (nothing to something) with multiple, simultaneous battles leading to a point-based win. Chess has the predetermined object of killing one individual piece (the king). In Go, individual pieces are only significant as they join or help determine the fate of larger forces, and those are determined only as the game proceeds. A similar comparison has been drawn among Go, chess and backgammon, perhaps the three oldest games that still enjoy worldwide popularity. Backgammon is a contest of "man versus fate," with chance playing an important role in determining the outcome. Chess, with rows of soldiers marching forward to capture each other, embodies the conflict of "man versus man." Go can be seen as embodying the quest for self-improvement, "man versus self," because it's handicap system tells each Go player where he/she stands relative to other players, giving an honestly ranked player the reasonable expectation of losing about half of his/her games. Although there are usually less than 50 playable (meaning acceptable) moves in a game of Go (and not uncommonly even fewer than 10), the area of the board is very large (five times the size of a chess board) and the number of legal moves in progress at any time rarely goes below 50. Throughout most of the game the number of legal moves in process stays at around 150-250; computers have difficulty distinguishing between good and bad moves. Whereas in most games based on capture (e.g. chess, checkers) the game becomes simpler over time as pieces disappear, in Go, a new piece appears with every move, and the game becomes progressively more complex, at least for the first 100 plays. Unlike other games, a material advantage in Go does not guarantee a simple means to victory, and may just signify that short-term gain has been given priority. The non-local nature of the "ko rule" has to be kept in mind in advanced play. There is a very high degree of pattern recognition involved in human capacity to play well. Internet-based Go servers allow people all over the world to play one another. Online Go playing is becoming popular, with many strong amateur players and pros taking part. There are numerous Go websites. Game records can be stored in files and kept in a database. One can then search the database for a particular opening strategy, or for games by a particular player. Electronic databases now provide a convenient, efficient way to study joseki, fuseki, life and death situations, and other problems. This development has had a major impact on the information on high-level play that is generally available. Computers make it easy to review and study game records. Many comments and annotated variations can be included in one file. Teachers can review a player's game records and attach variations and comments. Many teachers now use this method online, instructing students they may never have met. There are many variations on the basic game of Go. Many of the modern variants are purely for fun, but some were invented with a specific purpose in mind. For example capture Go is used for introducing the game to beginners, whilst rengo (paired Go) aims at the promotion of the game amongst women. There are also historical regional variations that have now fallen out of fashion, such as Sunjang Baduk or Tibetan Go. 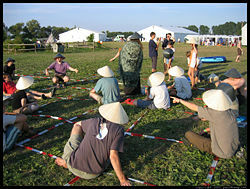 Go played using humans wearing hats (black or white) in place of stones (black or white) on a grid laid out in the grass. There are some instances in modern culture where Go and its strategies have been used as a literary concept or theme. The 1979 novel Shibumi by Trevanian, centers around the game and uses Go metaphors. Go symbolism is used in the Chung Kuo series of novels, and Rick Cook's Limbo System. Other novels that have centered around the game include the Prix Goncourt des Lycéens and Kiriyama Prize winner The Girl Who Played Go by Shan Sa,   Nobel prize-winner Yasunari Kawabata's The Master of Go, Sung-Hwa Hong's First Kyu, Scarlett Thomas's PopCo, and Jean-Jacques Pelletier' s Blunt: Les Treize Derniers Jours. a Nikita story arc with the character "Jurgen." the Star Trek: Enterprise episode titled "The Cogenitor," in which Charles Tucker plays Go. Andromeda, in which Dylan Hunt and Gaheris Rhade both play a futuristic version of Go. in episode 15 of season 3 of 24, with several scenes in an underground Chinese Go club. a 1980s television series called Chessgame with Terence Stamp as a spy master who would spend long periods studying a Go board. In films Go has appeared in Heaven Knows, Mr. Allison, A Beautiful Mind, Pi, Restless, After the Sunset, and Hero among many others. The game is featured in the manga and anime series Hikaru no Go and Naruto. At the end of each episode of the anime version of Hikaru no Go, a three minute segment teaches a concept of Go. 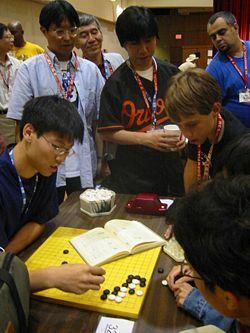 Three Japanese professional Go players observe some younger amateurs as they dissect a life and death problem in the corner of the board, at the US Go Congress in Houston, Texas, 2003. Standard Byo-Yomi: After the main time is depleted, a player has a certain number of time periods (typically around thirty seconds). After each move, the number of time periods that the player took (possibly zero) is subtracted. For example, if a player has three thirty-second time periods and takes thirty or more (but less than sixty) seconds to make a move, he loses one time period. With 60-89 seconds, he loses two time periods, and so on. If, however, he takes less than thirty seconds, the timer simply resets without subtracting any periods. This is written as <maintime> + <number of byo-yomi time periods> of <byo-yomi time period>. Using up the last period means that the player has lost on time. Canadian Byo-Yomi: After using all of his/her main time, a player must make a certain number of moves within a certain period of time, for example, twenty moves within five minutes. Typically, players stop the clock, and the player in overtime sets his/her clock for the desired interval, counts out the required number of stones and sets the remaining stones out of reach, so as not to become confused. (Some game clocks, notably the Ing clock, do not permit this option.) If twenty moves are made in time, the timer is reset to five minutes again. This is written as <main time> + <number of moves to be completed in each byo-yomi time period> in <byo-yomi time period>. (The Origins of Canadian Byo-Yomi) If the time period expires without the required number of stones having been played, then the player has lost on time. Most tournaments use standard or Canadian overtime. On the Internet, most players prefer a very short basic time, as little as one minute, moving into overtime right away so that the game progresses more quickly. There are three other overtime rules, but they are seldom used. Sudden Death: Each player receives a specific amount of time for the entire game with no overtime provisions, if a player's flag falls, they have lost on time. This rule is extremely rare except in "lightning" tournaments. Progressive Byo-Yomi: A variation of Canadian byo-yomi, where in each successive overtime period the player must make more moves, use less time, or both. For instance, in one amateur tournament the main time of fifty minutes was followed by twenty moves in five minutes, then forty moves in five minutes, then sixty moves in five minutes (the last time period being repeated until the game ended). Thus, this tournament's timing was written 50+20/5+40/5+60/5 (it is common to leave minutes as numbers without units while seconds are usually written in the form 5s). Penalty Points: If a player uses up to one-sixth of the basic time allotment (in addition to using all basic time), he/she incurs a two point penalty. Three such penalties can be imposed. If the player uses more than 50% of additional time, he/she forfeits the game. For instance, if the basic time is one hour per player, a player who goes beyond sixty minutes incurs a two point penalty. At seventy-one minutes, an additional two-point penalty is imposed, and a final penalty kicks in at eighty-one minutes. At ninety minutes, the player forfeits the game. This system was invented as part of "Ing's SST Laws of Go" but is seldom applied, even when other provisions of Ing rules are used. Japanese Timing with a single byo-yomi period is equivalent to Canadian byo-yomi with one stone to be played in each period. A large (by US standards) American amateur tournament has begun using Fischer timing , which is now common in Chess. The most significant difference from traditional practice is that there is no separate overtime mode of play. In addition to the initial allotment of time, a fixed number of seconds is added to a player's time for each move played during the entire game. As the time approaches zero, the player's pace must speed up to average one move in the designated number of seconds, but it is possible to gain clock time by playing more rapidly. This may correspond better to the natural style of thinking in Go. A sequence of moves requires time to read out, but the moves may then be played quickly. Although the game was developed in China, Japan-based players dominated the international Go scene for most of the twentieth century. However, professional players from China such as Nie Weiping (from the 1980s) and South Korea (since the 1990s) have reached even higher levels. Nowadays, top players from China and Korea are of similar strength, but Japan is increasingly lagging behind. Professionals from these three countries regularly compete in a number of national and international Go tournaments. The top Japanese tournaments have a prize purse comparable to that of professional golf tournaments in the United States, while tournaments in China and Korea are less lavishly funded. Korean players have had an edge in the major international titles, winning 23 tournaments in a row between 2000 and 2002. In the last few years, Korean dominance in international competitions has been increasingly challenged by their Chinese counterparts. The level of play in other countries has traditionally been much lower (apart from Taiwan), except for some players who had preparatory professional training in Asia. It was not until 2000 that a Westerner, Michael Redmond, achieved the top rank awarded by an Asian Go association, 9th dan. A German scientist, Oscar Korschelt, is credited with the first systematic description of the game in a Western language in 1880; it was not until the 1950s that Western players took up the game as more than a passing interest. In 1978, Manfred Wimmer became the first Westerner to receive a professional player's certificate from an Asian professional Go association. ↑ Potter, Donald L., "Go in the Classics (ii): the Tso-chuan," Go World, 42 (Winter 1985-86): 19-21. ↑ Kiseido. The Four Accomplishments Retrieved August 10, 2007. ↑ why computer Go is so hard to write Retrieved August 22, 2007. ↑ [http://www.usgo.org/resources/servers.html Retrieved August 22, 2007. ↑ Trevanian as quoted in McDonald, Brian (1995, 2002). Go in Western Literature p.5-6. Retrieved August 11, 2007. ↑ Smith, Sarah (May 24, 2003),  Rules of the game The Guardian. Retrieved August 11, 2007. ↑ American Go Association. Go in Print. Retrieved August 11, 2007. ↑ European Go Federation. Internet Go Filmography. Retrieved August 11, 2007. Kageyama Toshiro, Lessons in the Fundamentals of Go. Kiseido Publishing Company, 1978. Haruyama Isamu; Nagahara Yoshiaki. Basic Techniques of Go, Tokyo: Ishi Press, 1969. The Way of Go Retrieved August 6, 2007. Korean-style Insei League. Lectures and tutorials to improve Go skills for league members. History of "Go (board game)"
This page was last modified on 24 June 2017, at 15:27.